The aggregate market value on June 30, 2017 of the voting and non-voting common equity held by non-affiliates of the registrant was $455,655,342. For purposes of this calculation, the registrant has assumed that stockholders that are not officers or directors of the registrant are not affiliates of the registrant. The number of shares of registrant’s Common Stock, par value $0.01 per share, outstanding as of February 15, 2018: 8,897,995. Selected portions of the registrant’s definitive Proxy Statement for the 2018 Annual Meeting of Stockholders, which will be filed with the U.S. Securities and Exchange Commission within 120 days after the end of the fiscal year to which this report relates, are incorporated by reference into Part III hereof. We manage investment assets and provide services for our clients through our subsidiaries, Westwood Management Corp. and Westwood Advisors, L.L.C. (each of which is an SEC-registered investment adviser and referred to hereinafter together as “Westwood Management”), Westwood International Advisors Inc. (“Westwood International Advisors”) and Westwood Trust. Westwood Management, founded in 1983, provides investment advisory services to institutional investors, a family of mutual funds called the Westwood Funds®, other mutual funds, an Ireland-domiciled fund organized pursuant to the European Union’s Undertakings for Collective Investment in Transferable Securities (the “UCITS Fund”), individual investors and clients of Westwood Trust. Westwood International Advisors was established in 2012 and provides investment advisory services to institutional clients, the Westwood Funds®, other mutual funds, the UCITS Fund and clients of Westwood Trust. Westwood Trust, founded as a state-chartered trust company in 1974, provides trust and custodial services and participation in self-sponsored common trust funds to institutions and high net worth individuals. Our revenues are generally derived from fees based on a percentage of assets under management. Westwood Management, Westwood International Advisors and Westwood Trust collectively managed assets valued at approximately $24.2 billion at December 31, 2017. We were incorporated under the laws of the State of Delaware on December 12, 2001. Our common stock is listed on the New York Stock Exchange under the ticker symbol “WHG.” We are a holding company whose principal assets consist of the capital stock of Westwood Management, Westwood Trust and Westwood International Advisors. The success of our business is dependent on client and institutional investment consultant relationships. We believe that, in addition to investment performance, client service is paramount in the asset management business. Accordingly, a major business focus is to build strong relationships with clients to enhance our ability to anticipate their needs and satisfy their investment objectives. Our team approach is designed to deliver efficient, responsive service to our clients. We have focused on building our foundation in terms of personnel and infrastructure to support a larger business. We have developed investment strategies that we expect to be desirable within our target institutional, private wealth and mutual fund markets. Developing new investment strategies and building the organization can result in incurring expenses before significant offsetting revenues are realized. We continue to evaluate new strategies and resources in terms of meeting actual and potential investor needs. We maintain a website at westwoodgroup.com. Information contained on, or connected to, our website is not incorporated by reference into this Report and should not be considered part of this Report or any other filing that we make with the Securities and Exchange Commission (“SEC”). All of our filings with the SEC, including our annual report on Form 10-K, quarterly reports on Form 10-Q, current reports on Form 8-K and any amendments to those reports filed or furnished pursuant to Sections 13(a) or 15(d) of the Securities Exchange Act of 1934, as amended (the "Exchange Act"), are available free of charge on our website. Our Code of Business Conduct, Corporate Governance Guidelines and Audit Committee, Compensation Committee and Governance/Nominating Committee Charters are available without charge on our website. Stockholders also may obtain print copies of these documents free of charge by submitting a written request to Tiffany B. Kice, our Chief Financial Officer and Treasurer, at the address set forth on the front of this Report. The public can also obtain any public document we file with the SEC at www.sec.gov. Our advisory business is comprised of Westwood Management and Westwood International Advisors and encompasses three distinct investment teams – the U.S. Value Team, the Global Convertible Securities Team and the Global and Emerging Markets Equity Team. Westwood International Advisors, based in Toronto, Canada, provides investment advisory services to large institutions, pooled investment vehicles and the UCITS Fund, as well as subadvisory services to the National Bank Westwood Funds, which are mutual funds offered by National Bank of Canada. Institutional separate account minimums vary by investment strategy and generally range from $10 million to $25 million. Westwood International Advisor's investment strategies are managed by the Global and Emerging Markets Equity Team, with an average of twenty-three years of investment experience. Westwood International Advisors has entered into a Memorandum of Understanding (“MOU”) with Westwood Management pursuant to which Westwood International Advisors is considered a “participating affiliate” of Westwood Management as that term is used in relief granted by the staff of the SEC allowing U.S. registered investment advisers to use portfolio management or research resources of advisory affiliates subject to the supervision of a registered adviser. Pursuant to the MOU, Westwood International Advisors professionals provide advisory and subadvisory services to certain Westwood Funds®, pooled investment vehicles and large institutions under the supervision of Westwood Management. We offer a broad range of investment strategies, which allows us to serve a variety of client types with different investment objectives, including six investment strategies each with over $1 billion in assets under management: our Income Opportunity, LargeCap Value, SMidCap, SmallCap Value, Emerging Markets and Emerging Markets Plus strategies. Concentrated LargeCap Value: Investments in equity securities of approximately 15 to 30 companies with market capitalizations at purchase generally over $5 billion. Master Limited Partnership Infrastructure Renewal: Investments in the securities of approximately 25 to 35 companies that span across MLP subsectors and/or have MLP-like characteristics, with market capitalizations of any size and generally with a 7.5% maximum position size at purchase, unless the security is held by the index. If the security is held by the index, then the portfolio may hold up to the weight in the index. Master Limited Partnership Opportunities: Investments in the securities of approximately 25 to 35 companies that span across MLP subsectors and/or have MLP-like characteristics, with market capitalizations of any size and generally with a 4% maximum position size at purchase. Master Limited Partnership and Strategic Energy: Investments in the securities of approximately 25 to 40 companies that span across MLP subsectors, have MLP-like characteristics, and/or primarily involve energy-related activities, with market capitalizations of any size. Investments in publicly traded partnerships for this strategy will be limited to 25% of the portfolio. Flexible Income Strategy: Investments in securities across a company’s capital structure with the objective of achieving higher yield and lower volatility than other income alternatives strategies. (Jointly managed by U.S. Value and Global Convertible Securities teams). Emerging Markets SMidCap: Investments in equity securities of approximately 70 to 90 emerging markets companies with market capitalizations at purchase generally between $150 million and $9 billion. Global Equity: Investments in equity securities of approximately 65 to 85 global companies with market capitalizations generally over $1 billion. International Equity: Investments in equity securities of approximately 40 to 60 companies in Europe, Australasia and the Far East with market capitalizations generally over $500 million. Our ability to grow assets under management is primarily dependent on our ability to generate competitive investment performance, our success in building strong relationships with investment consulting firms and other financial intermediaries, as well as our ability to develop new client relationships while nurturing and maintaining existing relationships. We continually seek to expand assets under management by growing our existing investment strategies, as well as identifying and developing new ones. We intend to grow our investment strategies internally but may also consider acquiring new investment strategies from third parties, as discussed under “Growth Strategy” below. Our growth strategy provides clients with more investment opportunities and diversifies our assets under management, thereby reducing risk in any one area of investment and increasing our competitive ability to attract new clients. Our ten largest clients accounted for approximately 20% of our fee revenues for the year ended December 31, 2017. The loss of some or all of these large clients could have a material adverse effect on our business and our results of operations. As of December 31, 2017, the Westwood Funds® had assets under management of $4.2 billion. Through the combined efforts of the Dallas, Omaha and Houston offices of Westwood Trust, we provide fiduciary and investment services to high net worth individuals and families, non-profit endowments and foundations, public and private retirement plans and individual retirement accounts ("IRAs"). Westwood Trust is chartered and regulated by the Texas Department of Banking. Fees charged by Westwood Trust are separately negotiated with each client and are typically based on assets under management. Clients generally have at least $1 million in investable assets. On September 6, 2017, we entered into an agreement to sell the Omaha-based component of our Private Wealth business. The sale was completed on January 12, 2018. The sale does not represent a major strategic shift in our business. Further information on the sale is included in Note 16 "Subsequent Events" to our Consolidated Financial Statements included in Part II, Item 8, "Financial Statements and Supplementary Data" accompanying this Report. Westwood Trust utilizes a consultative approach in developing a client’s portfolio asset allocation. Our approach involves examining the client’s financial situation, including their current portfolio of investments, and advising the client on ways to reduce risk, enhance investment returns and strengthen their financial position based on each client’s unique objectives and constraints. Westwood Trust seeks to define and improve risk/return profiles of client investment portfolios by offering a comprehensive investment solution or enhancing clients’ existing investment strategies. Westwood Trust manages separate portfolios of equity and fixed income securities for certain agency and trust clients. Equity portfolios are generally patterned after the institutional strategies offered by Westwood Management or developed by the internal investment team in our Houston office. Fixed income portfolios consist of targeted laddered portfolios of primarily high-quality municipal securities. In late 2016, we launched the Westwood Select Equity strategy via separately managed accounts that aim to provide low-frequency turnover and tax efficiency to high net worth individuals. The offering allows individuals to own a diversified portfolio of best ideas from across Westwood's investment teams. The portfolios are diversified and include value and growth stocks, along with small, mid and large-cap stocks. Westwood Select Equity is also available without the tax efficiency overlay. In our mutual funds channel, we market our registered mutual funds, the Westwood Funds®, to institutional investment consultants, financial intermediaries, registered investment advisers, select broker-dealers and fund supermarkets. By leveraging our existing relationships with institutional investment consulting firms we are able to participate when their defined contribution and other retirement plan clients require a mutual fund vehicle. We have also engaged a third-party distribution firm focused on select investment advisors and broker-dealers in the United States. We also seek relationships with financial intermediaries that manage discretionary fund models in order to have our funds placed in such models. Our wholesaling group markets our funds directly to registered investment advisers, select broker-dealers and mutual fund supermarkets. In our private wealth channel, we generate awareness of our trust fiduciary and investment services through investment consultants, centers of influence, community involvement, and targeted direct marketing to high net worth individuals, families and small to medium-sized institutions. We also seek asset growth generated by referrals from existing clients. Generate growth from new and existing clients and consultant relationships. As our primary business objective, we intend to maintain and enhance existing relationships with clients and investment consultants by providing solid investment performance and attentive client service. We also intend to pursue growth via targeted sales and marketing efforts that emphasize our investment philosophy, performance and superior client service. New institutional client accounts are sourced from either investment consultants or from our direct sales efforts with institutional investors. We believe that the in-depth knowledge of our firm, our people and our processes embedded in our consultant relationships, as well as in existing and prospective client relationships, is a key factor when being considered for new client investment mandates. Grow assets in our existing investment strategies. We have significant capacity to manage additional assets across our existing range of investment strategies, which we have continued to expand. We have developed a range of approximately 20 institutional investment strategies by building on the core competencies of our U.S. Value Team. Our Global and Emerging Markets Equity Team provides equity strategies that focus on emerging and global markets: Emerging Markets, Emerging Markets Plus, Emerging Markets SMid and Global Equity. Our emerging markets strategies have experienced strong investor demand, and we believe they provide additional growth opportunities. Our Global Convertible Securities Team manages a long-only strategy called Strategic Global Convertibles and a market neutral strategy called Market Neutral Income. Our U.S. Value Team has launched multiple strategies since 2014, including Concentrated LargeCap Value, MLP Opportunities, MLP & Strategic Energy, Worldwide Income Opportunity, Low Volatility Equity and Flexible Income. These offerings, in combination with our range of seasoned investment strategies, provide significant capacity to grow assets under management. We have the team in place to support these investment strategies and, with strong investment performance, we believe that demand for these strategies can provide meaningful growth for our assets under management. Foster continued growth of the private wealth platform and distribution channel. Westwood Trust serves small to medium-sized institutions as well as high net worth individuals and families. We anticipate continued interest from clients and prospects in our diversified, highly attentive service model. A significant percentage of asset growth at Westwood Trust stems from referrals, as well as gathering additional assets from existing clients. We believe that our Enhanced Balanced® strategy, which offers diversified exposure to multiple asset classes in a comprehensive manner, our Select Equity strategy, which offers diversified equity exposure in a tax-efficient manner, and our offerings for separately managed portfolios will all provide opportunities for growth. Additionally, as consumer demand for digital interaction with investment advisers and portfolios continues to grow, we are exploring opportunities to offer passive investment management strategies to enhance services to our private wealth clients. We believe that providing investors access to our mutual funds is a key component to achieving asset growth in the defined contribution and retirement marketplaces as well as with registered investment advisers. With the exception of Westwood Short Duration High Yield and Westwood Opportunistic High Yield, both of which are subadvised by SKY Harbor Capital Management, LLC, the Westwood Funds® generally mirror our institutional strategies. All funds offer capped expense ratios and are available in an institutional share class. We also offer Class A shares for Westwood LargeCap Value (WWLAX), Westwood Income Opportunity (WWIAX), Westwood Emerging Markets (WWEAX) and Westwood Short Duration High Yield (WSDAX) in order to target No Transaction Fee (NTF) mutual fund supermarket platforms and the broker/dealer marketplace. Westwood Market Neutral Income (WMNUX) and Westwood Opportunistic High Yield (WHYUX) offer an Ultra share class generally only available to institutional investors who purchase the fund directly and for which no shareholder servicing fees are paid. Pursue strategic corporate development opportunities. We evaluate strategic corporate development opportunities to augment organic growth. We may pursue various transactions, including acquisitions of asset management firms, mutual funds, private wealth firms, or other financial institutions, as well as hiring investment professionals or teams. We consider opportunities to enhance our existing operations, expand our range of investment strategies and services or further develop our distribution capabilities. By acquiring investment firms or by hiring investment professionals or teams that successfully manage investment strategies beyond our current expertise, we can both attract new clients and provide existing clients with an even more diversified range of investment strategies. We may also consider forging alliances with other financial services firms to leverage our core competency of developing and managing investment strategies with alliance partners that can provide enhanced distribution capabilities or additional service offerings. Pursue opportunities internationally through targeted sales and relationships with international distributors and institutional investors. In recent years we have increased our sales efforts outside of the U.S. As of December 31, 2017, non-U.S. clients represented approximately 23% of our assets under management compared with 12% as of December 31, 2013. The growth in our non-U.S. client base has primarily been a function of the broadening of our range of investment strategies to include Emerging Markets equity and Global Convertible Securities. In addition, we established a UCITS platform in 2012 and now offer three sub-funds under the UCITS umbrella for non-U.S. investors. We intend to continue our sales efforts outside of the U.S. We have also engaged a third-party distribution firm focused on intermediary and institutional distribution throughout Continental Europe. We may consider forging alliances with additional international financial services firms or partners to obtain enhanced distribution capabilities and greater access to global customers. Additionally, we continue to target select institutional clients around the globe. Continue to strengthen our brand name. We believe that the strength of our brand name has been a key component to our long-term success in the investment industry and will be instrumental to our future success. We have developed our strong brand name largely through our performance, coupled with high profile coverage in investment publications and electronic media. Several of our investment professionals have been visible in print and electronic media, and we will continue to look for creative ways to strengthen our brand name and reputation in our target markets. Develop or acquire new investment strategies. We continue to look for opportunities to expand the range of investment strategies that we offer to existing and prospective clients. We may consider internally-developed strategies that extend our existing investment process to new markets and may also consider externally acquired investment strategies. An expanded range of investment strategies offers additional ways to serve our client base, generating more diversified revenue streams, as well as providing asset and revenue growth opportunities. Further, we compete with other asset management firms on the basis of investment strategies offered, their investment performance both in absolute terms and relative to peer groups, quality of service, fees charged, the level and type of compensation offered to key employees and the manner in which investment strategies are marketed. Many of our competitors offer more investment strategies and services and have substantially greater assets under management. We compete against numerous investment dealers, banks, insurance companies, mutual fund companies, exchange-traded funds, brokerage and investment firms and others that sell equity funds, taxable income funds, tax-free investments and other investment products. In addition, the allocation of assets by many investors from active equity investment to index funds, fixed income or similar asset classes has enhanced the ability of firms offering non-equity asset classes and passive equity management to compete effectively with us. The demand for passive strategies with low-fee structures has rapidly increased, and investors are more frequently demanding customized and personalized strategies to fit their investment needs. This shift in the marketplace may benefit competitors that offer certain investment vehicles that we do not currently offer. In summary, our competitive landscape is intense and dynamic, and we may not be able to compete successfully in the future as an independent company. laws and regulations, including the USA PATRIOT Act of 2001, as subsequently amended and reauthorized (the "Patriot Act"). We believe that we are in compliance with the regulations under the Investment Advisers Act, the Investment Company Act and the Patriot Act. As an investment adviser, we have a fiduciary duty to our clients. The SEC has interpreted that duty to impose standards, requirements and limitations on, among other things: trading of client accounts, allocation of investment opportunities among clients, use of soft dollars, execution of transactions and recommendations to clients. We manage accounts for our clients with the authority to buy and sell securities, select broker-dealers to execute trades and negotiate brokerage commission rates. We may receive soft dollar credits from certain broker-dealers that are used to pay for brokerage and research related products, which reduces certain company operating expenses. We intend to use soft dollars to pay for only those brokerage and research related products and services that fall within the safe harbor provisions of the Securities Exchange Act of 1934. If our ability to use soft dollars were reduced or eliminated as a result of the implementation of statutory amendments or new regulations, our operating expenses would increase. Westwood Trust is limited by the Finance Code in the payment of dividends to undivided profits, which is described as the part of equity capital equal to the balance of net profits, income, gains, and losses since formation minus subsequent distributions to stockholders and transfers to surplus or capital under share dividends or appropriate board resolutions. At the discretion of its Board of Directors, Westwood Trust has made quarterly and special dividend payments to Westwood Holdings Group, Inc. out of undivided profits. Westwood International Advisors is registered with both the Ontario Securities Commission (“OSC”) and the Autorité des marchés financiers (“AMF”) in Québec. government and is funded by fees charged to market participants. The OSC is accountable to the Ontario Legislature through the Minister of Finance. In April 2016, the U.S. Department of Labor (the "DOL") issued a final rule, which expanded the definition of an investment advice fiduciary under ERISA and the Internal Revenue Code. The rule expands the scope of investment advice subject to fiduciary standards by imposing ERISA fiduciary standards on advisors of individual retirement accounts. The rule focuses on conflicts of interest related to investment recommendations made by financial advisors, registered investment advisers and other investment professionals. The rule became applicable on June 9, 2017, with certain requirements deferred until July 1, 2019. We have made the necessary operational changes to comply with the rule. On December 22, 2017, the President of the United States signed into law the Tax Cuts and Jobs Act (the “Tax Reform Act”). The legislation significantly changes U.S. tax law by, among other things, lowering corporate income tax rates and creating a territorial tax system with a one-time mandatory deemed repatriation tax on previously deferred earnings of foreign subsidiaries. The Tax Reform Act permanently reduces the U.S. corporate income tax rate from a maximum of 35% to a flat 21% rate, effective January 1, 2018. We have provisionally recognized the incremental tax impacts related to deemed repatriated earnings and the revaluation of deferred tax assets and liabilities and included these amounts in our Consolidated Financial Statements for the year ended December 31, 2017. The ultimate impact may differ from these provisional amounts, possibly materially, due to, among other things, additional analysis, changes in interpretations and assumptions we have made, additional regulatory guidance that may be issued and actions we may take as a result of the Tax Reform Act. The accounting is expected to be complete when our 2017 U.S. corporate income tax return is filed in the third quarter of 2018. Further information on the tax impacts of the Tax Reform Act is included in Note 7 "Income Taxes" to our Consolidated Financial Statements included in Part II, Item 8, "Financial Statements and Supplementary Data" accompanying this Report. At December 31, 2017, we had 181 full-time employees (166 based in the United States and 15 based in Canada). No employees are represented by a labor union, and we believe our employee relations to be favorable. For information about our operating segments, Advisory and Trust, please see Note 14 "Segment Reporting" to our Consolidated Financial Statements included in Part II, Item 8, "Financial Statements and Supplementary Data" accompanying this Report. Investment performance: Because we compete with many asset management firms on the basis of our investment strategies, the maintenance and growth of assets under management is dependent, to a significant extent, on the investment performance of the assets that we manage. Poor performance may result in the loss or reduction of client accounts, which decreases revenues. Underperformance relative to peer groups and/or relevant benchmarks for our various investment strategies could adversely affect our results of operations, especially if such underperformance continues for an extended period of time. The historical returns of our strategies and the ratings and rankings we, or the mutual funds that we advise, have received in the past should not be considered indicative of the future results of these strategies or of any other strategies that we may develop in the future. The investment performance we achieve for our customers varies over time and variances can be wide. In addition, certain of our investment strategies have capacity constraints, as there is a limit to the number of securities available for certain strategies to operate effectively. In those instances, we may choose to limit access to new or existing investors. In addition, the regulatory environment in which we operate is subject to change. We may be adversely affected as a result of new or revised legislation or regulations or by changes in the interpretation or enforcement of existing laws and regulations. In recent years, regulators have increased their oversight of the financial services industry. Some regulations are focused directly on the investment management industry, while others are more broadly focused but affect our industry as well. In April 2016, the DOL issued a final rule regarding the definition of an investment advice fiduciary under ERISA and the Internal Revenue Code. The rule expands the scope of investment advice subject to fiduciary standards by imposing ERISA fiduciary standards to advisors of individual retirement accounts. The rule focuses on conflicts of interest related to investment recommendations made by financial advisors, registered investment advisors and other investment professionals. The rule became applicable on June 9, 2017, with certain requirements deferred until July 1, 2019. While we have made necessary operational changes to comply with the rule, we continue to review and analyze the impact to our business and our clients. We will continue to monitor and make necessary operational changes to comply with the rule, but compliance with the rule and the related class exemptions could have a material adverse effect on our business. We engage in product offerings and international business activities through our global and emerging markets, global multi-asset, and global convertible securities product offerings. Additionally, our domestic client base continues to expand internationally. As of December 31, 2017, approximately 23% of our AUM is managed for clients who are domiciled outside the United States. As a result, we face increased operational, regulatory, compliance, marketing, client service, reputational and foreign exchange rate risks. In particular, rapid regulatory change is occurring internationally with respect to financial institutions, including, but not limited to, anticipated revisions to the European Communities (Undertakings for Collective Investment in Transferable Securities) Regulations 2011 and the Markets in Financial Instruments Directive (MiFID II). The failure of our compliance and internal control systems to properly identify and mitigate such additional risks, or of our operating infrastructure to support international activities, could result in operational failures and actions by regulatory agencies, which could have a material adverse effect on our business. The investment management and private wealth industry is highly competitive and innovative. Potential competitors have a relatively low cost of entering the investment management industry. Many competitors have greater financial, technological, marketing and other resources, more comprehensive name recognition and more personnel than we do. The continuing trend toward consolidation in the investment management industry, and the securities business in general, has served to increase the size and strength of some of our competitors. Recent changes in consumer demand for technological capabilities, including the enhanced ability for firms to offer passive management strategies, has increased competition in our industry. Shifts in demand for alternative investment styles, asset classes and distribution vehicles may cause our competitors to be perceived as more attractive. Other industry participants, hedge funds and alternative asset managers may seek to recruit our investment professionals. Some competitors charge lower fees for their investment management services than we do. Some competitors may provide more comprehensive client services, including banking, financial planning and tax planning at levels beyond what we currently provide. Some competitors may have more sophisticated, innovative or advanced distribution networks that we do. If we are unable to compete effectively, our earnings could be reduced and our business could be adversely affected. As of December 31, 2017, approximately 27% of our assets under management were invested in strategies offering access to global and emerging markets with significant exposure to non-U.S. companies. Fluctuations in foreign currency exchange rates could negatively affect the returns of clients invested in these strategies. Investments in non-U.S. issuers may also be affected by tax positions taken in countries or regions in which we are invested, as well as political, social and economic uncertainty or other diplomatic developments. Many financial markets are less developed or efficient than U.S. financial markets and therefore may have limited liquidity and higher price volatility, and may lack an established regulatory framework. Liquidity and price volatility may also be adversely affected by political or economic events, government policies and social or civil unrest within a particular country. These risks, among others, could adversely affect the performance of our strategies invested in securities of non-U.S. issuers and may be particularly acute in the emerging or less developed markets in which we invest. As a result, we may be unable to attract or retain client investments in these strategies, or assets invested in these strategies may experience significant declines in value and our results of operations may be negatively affected. The development of new investment strategies, whether through acquisition or internal development, requires a substantial amount of time and significant financial resources, including expenses related to compensation, sales and marketing, information technology, legal counsel and other professional services. Our ability to market and sell a new investment strategy depends on our financial resources, the investment performance of the specific strategy, the timing of the offering, the timing of regulatory approvals and our marketing strategies. Once an investment strategy is developed, we must effectively introduce the strategy to existing and prospective clients. Our ability to sell new investment strategies to existing and prospective clients may depend on our ability to meet or exceed the performance of our competitors offering the same or a similar strategy. We may not be able to manage the assets within a given investment strategy profitably, and it may take years before we produce the level of results that will attract clients. If we are unable to realize the benefits of the costs and expenses incurred in developing new investment strategies, we may experience losses as a result of our management of these investment strategies, and our ability to introduce further new investment strategies and compete in our industry may be hampered. To introduce new investment strategies, we may also seek to add new investment teams. To the extent we are unable to recruit and retain investment teams that will complement our existing business model, we may not be successful in further diversifying and increasing our investment strategies and client assets, which could have a material adverse effect on our business and future prospects. The addition of a new team using an investment strategy with which we may have limited or no experience may require additional resources to update our operational platform and could strain our operational resources and increase the possibility of operational error. In such case, additional investments may be required to improve our operational platform. If any such new teams or strategies perform poorly and fail to attract sufficient assets, our results of operations and reputation will be adversely affected. Our future success depends upon our ability to attract and retain professional and executive employees, including investment, marketing, client service and management personnel. There is substantial competition for skilled personnel within the asset management business, and the failure to attract, develop, retain and motivate qualified personnel could negatively impact our business, financial condition, results of operations and future prospects. A limited number of our employees, including our Chief Executive Officer, Chief Investment Officer and certain investment employees, have employment contracts, and certain key employees do not have employment contracts. In order to retain or replace our key personnel, we may be required to increase compensation, which would decrease net income. Additionally, investment and sales professionals often maintain strong relationships with their clients, and their departure may cause us to lose client accounts, which could have a material impact on our revenues and results of operations. Damage to our reputation could impede our ability to attract and retain customers and key employees and could reduce our assets under management, which could have a material adverse effect on our results of operations. Significant regulatory sanctions, fines, penalties, and litigation could also materially adversely effect our financial condition and results of operations. Our business is dependent on information technology systems and the cyber security controls we have in place to protect those systems and the information contained therein. A failure of our controls to protect our information technology from an external or internal attack or to prevent a breach of confidential client or competitive information could materially interrupt our operations and expose us to regulatory and legal actions, which could have a material adverse effect on our operating results, reputation and stock price. Acquisitions involve inherent risks that could compromise the success of the combined business and dilute the holdings of current stockholders. As part of our long-term business strategy, we may pursue corporate development transactions including the acquisition of asset management firms, mutual funds, private wealth firms and investment professionals or teams. See “Item 1. Business — Growth Strategy.” If we are incorrect when assessing the value, strengths, weaknesses, liabilities and potential profitability of such transactions, or if we fail to adequately integrate the acquired businesses or individuals, the success of the combined business could be compromised. Business acquisitions are subject to the risks commonly associated with such transactions including, among others, potential exposure to unknown liabilities of acquired companies and to acquisition costs and expenses, the difficulty and expense of integrating the operations and personnel of the acquired companies, potential disruptions to the business of the combined company and potential diversion of management’s time and attention, the impairment of relationships with and the possible loss of key employees and clients as a result of changes in management, potential litigation or other legal risks, potential write-downs related to goodwill impairments in connection with acquisitions and dilution to the stockholders of the combined company if the acquisition is made for stock of the combined company. In addition, investment strategies, technologies or businesses of acquired companies may not be effectively assimilated into our business or may have a negative effect on the combined company’s revenues or earnings. The combined company may also incur significant expenses to complete acquisitions and support acquired investment strategies and businesses. Further, any such acquisitions may be funded with cash, debt or equity, which could dilute the holdings or limit the rights of stockholders. Finally, we may not be successful in identifying attractive acquisition candidates or completing acquisitions on favorable terms. Divestitures involve inherent risks that could compromise the success of our business. As part of our long-term strategy, we entered into an agreement to sell the Omaha-based component of our private wealth business. Risks related to divestiture transactions can include difficulties in the separation of the divested business, loss of clients, retention or obligation to indemnify certain liabilities, the failure of counterparties to satisfy payment obligations, unfavorable market conditions that may impact any earnout or contingency payment due to us and unexpected difficulties in losing employees of the divested business. As consumer demand for digital interaction with investment advisors and portfolios continues to grow, we are exploring opportunities to offer passive investment management strategies to enhance services to our private wealth clients. If we are incorrect in assessing the value, strengths, weaknesses and potential profitability of such passive strategies, or if we fail to adequately integrate the strategies into our private wealth business, the success of our overall business could be compromised. The initial investment in the necessary technological capabilities and the potential diversion of management’s time and attention could have a material impact to our business, financial condition and results of operations. certain software. We, or our third-party vendors, may suffer a systems failure or interruption, whether caused by an earthquake, fire, other natural disaster, power or telecommunications failure, unauthorized access, force majeure, act of war or otherwise, and back-up procedures and capabilities may be inadequate to prevent the risk of extended interruptions in operations. Our employees and certain third-party vendors handle significant amounts of assets along with financial and personal information for our clients. Our employees could misuse or improperly disclose such information, either inadvertently or intentionally, which could harm our reputation. We have implemented a system of controls to minimize the risk of fraudulent use of assets and information; however, our controls may be insufficient to prevent fraudulent actions by employees. If our controls are ineffective, we could be subject to costly litigation, which could consume financial resources, distract management, damage our reputation and result in regulatory sanctions. Such fraudulent actions could also adversely affect clients, causing them to seek redress. Many aspects of our business involve substantial risks of liability. We could be named as defendants or co-defendants in lawsuits or could be involved in disputes that involve the threat of lawsuits seeking substantial damages. As an SEC-registered investment adviser, mutual fund adviser and publicly-traded entity, we are subject to governmental and self-regulatory organization examinations, investigations and proceedings. Similarly, the investment strategies that we manage could be subject to actual or threatened lawsuits and governmental and self-regulatory organization investigations and proceedings, any of which could harm the investment returns or reputation of the applicable fund or result in our being liable for any resulting damages. There has been an increased incidence of litigation and regulatory investigations in the asset management industry in recent years, including customer claims, as well as class action suits seeking substantial damages. While customers do not have legal recourse against us solely on the basis of poor investment results, if our investment strategies perform poorly or we provide poor financial advice, we are more likely to become subject to litigation brought by dissatisfied clients. In addition, to the extent customers are successful in claiming that their losses resulted from fraud, negligence, willful misconduct, breach of contract or other similar misconduct, these clients may have remedies against us, the mutual funds and other funds we advise or our investment professionals under the federal securities laws or state law. See the discussion of legal proceedings in Item 3. “Legal Proceedings”. Failure to properly address conflicts of interest could harm our reputation or cause clients to withdraw funds, each of which could adversely affect our business and results of operations. In addition, as we expand the scope of our business and our client base, we must continue to monitor and address any potential new conflicts between the interests of our stockholders and those of our clients. Our clients may withdraw funds if they perceive conflicts of interest between the investment decisions we make for strategies in which they have invested and our obligations to our stockholders. For example, we may limit the growth of assets in or close strategies or otherwise take action to slow the flow of assets when we believe it is in the best interest of our clients, even though our assets under management and investment management fees may be negatively impacted. Similarly, we may establish or add new investment teams or expand operations into other geographic areas or jurisdictions if we believe such actions are in the best interest of our clients, even though our results of operations may be adversely affected in the short term. Although we believe such actions enable us to retain client assets and maintain our profit margins, if clients perceive a change in our investment or operational decisions favors a strategy to maximize short term results, they may withdraw funds, which could adversely affect our revenues and results of operations. We maintain insurance coverage in amounts and on terms we believe appropriate to cover legal and regulatory matters and potential cyber security attacks; however, we can make no assurance that there will be adequate coverage or that a claim will be covered by our insurance policies at all. Additionally, insurance premiums may rise for substantially the same coverage amounts and terms, which will increase our expenses and reduce our net income. We cannot be certain that financing to fund our working capital or other cash requirements, if needed, will be available on favorable terms, if at all. Our capital requirements may vary greatly from quarter to quarter depending on, among other things, capital expenditures, fluctuations in our operating results and financing activities. If future financing becomes necessary, we may or may not be able to obtain financing on favorable terms, if at all. Further, any future equity financings could dilute the relative percentage ownership of then existing common stockholders, and any future debt financings could involve restrictive covenants that limit our ability to take certain actions. Effective internal controls are necessary to provide reliable financial reports. If we cannot provide reliable financial reports, our brand and operating results could be harmed. All internal control systems, no matter how well designed, have inherent limitations, and even systems determined to be effective can provide only reasonable assurance with respect to financial statement preparation and presentation. The prevailing market price of our common stock may fluctuate significantly in response to a number of factors, some of which are beyond our control, including (among other factors): actual or anticipated fluctuations in operating results; changes in market valuations of other similarly situated companies; additions or departures of key personnel; future sales of common stock; deviations in net revenues or in losses from levels expected by the investment community; and trading volume fluctuations. Our organizational documents contain provisions that require a vote of two-thirds of the shares of stock entitled to vote to remove directors with or without cause, establish that stockholders cannot act by written consent, and that authorize our Board of Directors to issue, without shareholder approval, blank check preferred stock. In addition, as a Delaware corporation, we are subject to Section 203 of the Delaware General Corporation Law relating to business combinations. These provisions could delay, deter or prevent a merger, consolidation, tender offer or other business combination or change of control involving us that could include a premium over the market price of our common stock that some or a majority of our stockholders might consider to be in their best interests. To the extent we have to compete on the basis of price, we may not be able to maintain a profitable fee structure. Although our investment management fees vary from product to product, we have competed primarily on the performance of our products and client service rather than on the level of our investment management fees relative to our competitors. In recent years, there has been a trend toward lower fees in the investment management industry. In order to maintain a profitable fee structure in a competitive environment, we must be able to continue to provide clients with investment returns and service levels that make investors willing to pay our fees. We cannot be assured that we will succeed in providing investment returns and service levels that will allow us to maintain a profitable fee structure. Fee reductions on existing or future new business could have an adverse effect on our profit margins and results of operations. In addition, we have performance fee agreements with a few clients, which pay us a fee if we outperform a specified index over predetermined periods of time. We may not be able to outperform such indexes, and failure to do so would cause us to earn none or only part of those potential revenues, which could have a material adverse effect on our revenues and results of operations. Our revenues from performance-based fees could fluctuate significantly from one measurement period to the next, depending on how we perform relative to the indexes specified in these agreements. For example, we earned performance fees of $1.4 million in 2017, $0.6 million in 2016 and $2.7 million in 2015. Substantially all of our revenues are derived pursuant to investment advisory, subadvisory and trust agreements with our clients, subject to termination without advance notice. Investors in funds that we advise or subadvise may redeem their investments at any time without prior notice, thereby reducing our assets under management. These investors may redeem for any reason, including general financial market conditions, our absolute or relative investment performance or their own financial condition and requirements. In a declining stock market, the pace of redemptions could accelerate. Redemption of a substantial amount of investments or a termination or failure to renew a material number of these agreements would adversely affect our revenues and have a material adverse effect on our earnings and financial condition. Our ten largest clients accounted for approximately 20% of our fee revenue for each of the years ended December 31, 2017, 2016 and 2015. We are dependent to a significant degree on our ability to maintain our relationships with these clients. There can be no assurance that we will be successful in maintaining existing client relationships, securing additional clients or achieving the superior investment performance necessary to earn performance-based advisory fees. Our failure to retain one or more of these large clients or to establish profitable relationships with additional clients could have a material adverse effect on our business, financial condition and results of operations. Westwood, Westwood Management and Westwood Trust conduct their principal operations using approximately 40,000 square feet of leased office space in Dallas, Texas pursuant to a lease with an initial term that expires in March 2026. In addition, we lease approximately 8,000 square feet of office space in Houston, Texas pursuant to a lease with a term that expires in June 2024 and approximately 2,000 square feet of office space in Framingham, Massachusetts pursuant to a lease with a term that expires in August 2023. Westwood International Advisors conducts its principal operations using approximately 6,000 square feet of office space in Toronto, Ontario pursuant to a lease with a term that expires in October 2021. We continue to assess these facilities to ensure their adequacy to serve our anticipated business needs. During 2017, we leased approximately 5,000 square feet of office space in Omaha, Nebraska pursuant to a lease with a term that was set to expire in July 2019. Upon the completion of the sale of our Omaha-based component of our Private Wealth business in January 2018, this lease was assigned to the buyer. On August 3, 2012, AGF Management Limited and AGF Investments Inc. (together “AGF”) filed a lawsuit in the Ontario Superior Court of Justice against Westwood, certain Westwood employees and Warren International, LLC ("Warren"), an executive recruiting firm. The action related to the hiring of certain members of Westwood’s global and emerging markets investment team previously employed by AGF. AGF alleged that the former employees breached certain obligations when they resigned from AGF and that Westwood and Warren induced such breaches. AGF sought an unspecified amount of damages and punitive damages of $10 million CDN in the lawsuit. On November 5, 2012, Westwood issued a response to AGF’s lawsuit with a counterclaim against AGF for defamation. Westwood sought $1 million CDN in general damages, $10 million CDN in special damages, $1 million CDN in punitive damages, and costs. On November 6, 2012, AGF filed a second lawsuit against Westwood, Westwood Management and an employee of a Westwood subsidiary, alleging that the employee made defamatory statements about AGF. In this second lawsuit, AGF sought $5 million CDN in general damages, $1 million CDN per defendant in punitive damages, unspecified special damages, interest and costs. On October 13, 2017, we reached a settlement with AGF that provides for the dismissal of all claims, with prejudice and without any admission of liability. We have agreed to pay AGF a one-time payment of $10 million CDN, half of which is expected to be covered by our insurance. We recorded a net $4.0 million ($5 million CDN) charge related to the settlement and associated insurance coverage, with a $4.0 million ($5 million CDN) receivable from our insurance provider included in “Other current assets” on our Condensed Consolidated Balance Sheets at December 31, 2017. Our common stock trades on the New York Stock Exchange (the “NYSE”) under the symbol “WHG.” At December 31, 2017, there were approximately 236 record holders of our common stock, although we believe that the number of beneficial owners of our common stock is substantially greater. The table below presents the high and low closing prices for our common stock, as reported by the NYSE for the periods indicated. We have declared a cash dividend on our common stock for each quarter since our common stock was first publicly-traded. The table below sets forth the dividends declared per common share for the periods indicated. On February 8, 2018 we declared a quarterly cash dividend of $0.68 per share on our common stock payable on April 2, 2018 to stockholders of record on March 9, 2018. We intend to continue paying cash dividends in such amounts as our Board of Directors may determine to be appropriate. Any future payments of cash dividends will be at the discretion of the Board of Directors and subject to limitations under the Delaware General Corporation Law. On July 20, 2012, our Board of Directors authorized management to repurchase up to $10 million of our outstanding common stock on the open market or in privately negotiated transactions. The share repurchase program has no expiration date and may be discontinued at any time by the Board of Directors. In July 2016, Westwood's Board of Directors authorized an additional $5.0 million of repurchases under the share repurchase program. As of December 31, 2017, approximately $9.4 million remained available under the share repurchase program. 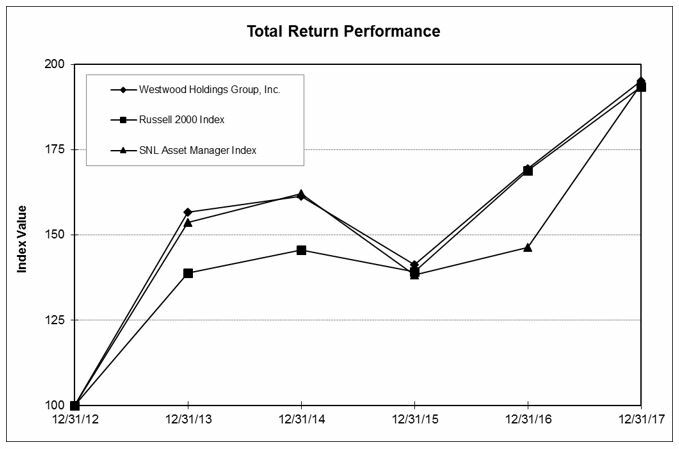 The following graph compares total stockholder returns of Westwood since December 31, 2012 with the total return of the Russell 2000 Index and the SNL Asset Manager Index, a composite of 42 publicly-traded asset management companies. The closing price of our common stock on the last trading day of the year ended December 31, 2017 was $66.21 per share. Historical stock price performance is not necessarily indicative of future price performance. Our 2017 financial results were negatively impacted by a $2.5 million legal settlement charge, net of insurance recovery and tax, and a $3.4 million incremental income tax expense related to tax reform. These items negatively impacted diluted earnings per share by $0.30 per share and $0.40 per share, respectively. Our 2016 financial results were negatively impacted by $1.3 million of one-time costs, net of tax, associated with implementation of new information technology platforms, which negatively impacted diluted earnings per share by $0.16 per share. We manage investment assets and provide services for our clients through our subsidiaries, Westwood Management, Westwood Trust and Westwood International Advisors. Westwood Management and Westwood International Advisors provide investment advisory services to institutional clients, the Westwood Funds®, other mutual funds, an Ireland-domiciled fund organized pursuant to the European Union’s Undertakings for Collective Investment in Transferable Securities (the “UCITS Fund”), individuals and clients of Westwood Trust. Westwood Trust provides trust and custodial services and participation in common trust funds to institutions and high net worth individuals. Our revenues are generally derived from fees based on a percentage of assets under management, and at December 31, 2017, Westwood Management, Westwood International Advisors and Westwood Trust collectively managed assets valued at approximately $24.2 billion. We believe we have established a track record of delivering competitive, risk-adjusted returns for our clients. With respect to the bulk of our client assets under management, we utilize a “value” investment style focused on achieving superior long-term, risk-adjusted returns by investing in companies with high levels of free cash flow, improving returns on equity, strengthening balance sheets and that are well positioned for growth but whose value is not fully recognized in the marketplace. This investment approach is designed to preserve capital during unfavorable periods and provide superior real returns over the long term. Our investment teams have significant industry experience. Our investment team members have average investment experience of seventeen years. We have focused on building a foundation in terms of personnel and infrastructure to support a potentially much larger business. We have also developed investment strategies that we believe will be desirable within our target institutional, private wealth and mutual fund markets. The cost of developing new products and growing the organization as a whole has resulted in our incurring expenses that, in some cases, do not currently have significant offsetting revenues. While we continue to evolve our products, we believe that the appropriate foundation and products are in place such that investors will recognize the value in these products, thereby generating new revenue streams for Westwood. Assets under management as of December 31, 2017 were $24.2 billion, a 14% increase compared to December 31, 2016. Quarterly average assets under management increased 9% to $23.1 billion for 2017 compared to 2016, which contributed to the 9% increase in total revenue in 2017. Strong performance of our SmallCap Value, Income Opportunity and LargeCap Value strategies. Resolution of the AGF litigation. Recorded $3.4 million incremental income tax expense related to tax reform. In October 2017, the Board approved a 10% increase in our quarterly dividend to $0.68 per share, or an annual rate of $2.72 per share, resulting in a dividend yield of 4.1% using the year-end stock price of $66.21 per share. Our financial position remains strong with liquid cash and investments of $105.6 million and no debt as of December 31, 2017. We agreed to sell our Omaha-based private wealth operations, which closed in January 2018. We derive our revenues from investment advisory fees, trust fees, and other revenues. Our advisory fees are generated by Westwood Management and Westwood International Advisors, which manage client accounts under investment advisory and subadvisory agreements. Advisory fees are calculated based on a percentage of assets under management and are paid in accordance with the terms of the agreements. Advisory fees are paid quarterly in advance based on assets under management on the last day of the preceding quarter, quarterly in arrears based on assets under management on the last day of the quarter just ended, or are based on a daily or monthly analysis of assets under management for the stated period. We recognize advisory fee revenues as services are rendered. A limited number of our clients have a contractual performance-based fee component in their contracts, which generates additional revenues if we outperform a specified index over a specific period of time. We record revenue for performance-based fees at the end of the measurement period. Since our advance paying clients’ billing periods coincide with the calendar quarter to which such payments relate, revenue is recognized within the quarter, and our Consolidated Financial Statements contain no deferred advisory fee revenues. Our trust fees are generated by Westwood Trust pursuant to trust or custodial agreements. Trust fees are separately negotiated with each client and are generally based on a percentage of assets under management. Westwood Trust also provides trust services to a small number of clients on a fixed fee basis. Trust fees are primarily paid quarterly in arrears, based on a daily average of assets under management for the quarter. Since billing periods for most of Westwood Trust's clients coincide with the calendar quarter, revenue is fully recognized within the quarter and our Consolidated Financial Statements do not contain a significant amount of deferred revenue. Assets under management increased $3.0 billion, or 14%, to $24.2 billion at December 31, 2017 compared to $21.2 billion at December 31, 2016. Quarterly average assets under management increased $2.0 billion, up 9%, to $23.1 billion for 2017 compared with $21.2 billion for 2016. The increase in average assets under management is due principally to market appreciation over the last twelve months and $713 million in a long-only convertibles fund that transitioned from assets under advisement (“AUA”) to AUM during the third quarter of 2017. Assets under management increased $479 million, or 2%, to $21.2 billion at December 31, 2016 compared to $20.8 billion at December 31, 2015. Quarterly average assets under management decreased $0.3 billion, down 2%, to $21.2 billion for 2016 compared with $21.5 billion for 2015. AUM for 2017, 2016 and 2015 excludes approximately $382 million, $1.0 billion and $337 million of AUA, respectively, related to our model portfolios, for which we provide consulting advice but do not have direct discretionary investment authority. During the third quarter of 2017, approximately $713 million related to a long-only convertibles fund transitioned from AUA to AUM. Our assets under management disclosure reflects management’s view of our three types of accounts: institutional, private wealth and mutual funds. Private Wealth includes assets for which Westwood Trust provides trust and custodial services and participation in common trust funds that it sponsors to institutions and high net worth individuals pursuant to trust or agency agreements and assets for which Westwood Advisors, L.L.C. provides advisory services in ten limited liability companies to high net worth individuals. Investment subadvisory services are provided for the common trust funds by Westwood Management, Westwood International Advisors and external, unaffiliated subadvisors. For certain assets in this category Westwood Trust currently provides limited custody services for a minimal or no fee, viewing these assets as potentially converting to fee-generating managed assets in the future. As an example, some assets in this category consist of low-basis stock currently held in custody for clients where we believe such assets may convert to fee-generating managed assets upon an inter-generational transfer of wealth. Mutual Funds include the Westwood Funds®, a family of mutual funds for which Westwood Management serves as advisor. These funds are available to individual investors, as well as offered as part of our investment strategies for institutional and private wealth accounts. Private Wealth outflows include approximately $397 million of assets related to the sale of our Omaha-based component of our Private Wealth business. The increase in assets under management for the year ended December 31, 2017 was due to market appreciation of $3.4 billion, partially offset by net outflows of $398 million, which included approximately $713 million of inflows in our Strategic Global Convertibles strategy that transitioned from AUA to AUM in the third quarter of 2017. Flows were primarily related to net outflows in our SmidCap strategies and LargeCap Value strategy, partially offset by net inflows in our SmallCap Value and Market Neutral Income strategies. Institutional outflows include approximately $30 million in an account that transitioned to our model portfolio for which we no longer have direct discretionary investment authority. This account is now included in AUA aggregating $1.0 billion as of December 31, 2016. Institutional inflows include approximately $330 million of assets related to our global convertibles strategy, which transitioned from AUA to AUM during the fourth quarter of 2015. The increase in assets under management for the year ended December 31, 2015 was due to the acquisition of Woodway, which contributed $1.6 billion of assets under management, and net inflows of $174 million, partially offset by market depreciation of $1.2 billion. Flows were primarily related to net inflows in our Income Opportunity, Emerging Markets, and Emerging Markets Plus strategies, partially offset by net outflows in our SMidCap, LargeCap Value, and Short Duration High Yield strategies. The following table and discussion of our results of operations is based upon data derived from our Consolidated Statements of Comprehensive Income contained in our Consolidated Financial Statements and should be read in conjunction with these statements, which are included elsewhere in this Report. Total Revenues. Total revenues increased $10.8 million, or 9%, to $133.8 million for 2017 compared with $123.0 million for 2016. The increase was attributable to a $7.7 million increase in asset-based advisory fees, a $1.3 million increase in Trust fees, and a $0.8 million increase in performance based fees. Advisory-based and Trust fees increased as a result of higher average assets under management in 2017 compared to 2016. Employee Compensation and Benefits. Employee compensation and benefit costs increased $3.4 million, or 6%, to $65.0 million in 2017 compared with $61.5 million in 2016. This increase was primarily due to higher incentive compensation and performance-based restricted stock expense as a result of improved pre-tax income (excluding legal settlement costs), as well as increased average headcount and merit increases. We had 181 full-time employees as of December 31, 2017 compared to 174 at December 31, 2016. Westwood Mutual Funds. Westwood mutual funds expenses increased 25% to $3.9 million for 2017 compared to $3.2 million for 2016. The increase was primarily due to increased overall shareholder servicing costs on higher mutual funds average assets under management and increased commission fees related to the addition of a third-party seller at the end of 2016. Legal Settlement. We recorded a net $4.0 million charge related to a legal settlement, net of associated insurance coverage, during the third quarter of 2017. See further discussion of the settlement in Note 13 “Commitments and Contingencies” to our Consolidated Financial Statements included in Part II, Item 8, “Financial Statements and Supplementary Data”. General and Administrative. General and administrative expenses increased 24% to $11.2 million for 2017 compared with $9.1 million for 2016, primarily due to a $1.6 million foreign currency transaction loss recorded in 2017 as a result of a 7% decrease in the Canadian dollar exchange rate. Provision for Income Taxes. The effective tax rate increased to 41.0% for 2017 compared to 33.4% for 2016. The increase is primarily related to the Tax Reform Act signed into law in December 2017. We recorded $3.4 million incremental income tax expense related to the mandatory deemed repatriation of earnings in our Canadian subsidiary and the revaluation of our deferred tax assets as a result of the decrease in the federal tax rate. Total Revenues. Total revenues decreased $7.9 million, or 6%, to $123.0 million for 2016 compared with $130.9 million for 2015. The decrease was attributable to a $7.8 million decrease in asset-based advisory fees and a $2.1 million decrease in performance-based fees, offset by a $1.5 million increase in Trust fees. Advisory-based fees decreased as a result of lower average assets under management in 2016 compared to 2015. Trust fees increased as a result of a full year of revenue generated by Woodway. Employee Compensation and Benefits. Employee compensation and benefit costs decreased $2.1 million, or 3%, to $61.5 million in 2016 compared with $63.6 million in 2015. This decrease was primarily due to a $3.0 million decrease in incentive compensation due to lower results for 2016 and a one-time $1.6 million restricted stock charge primarily related to a non-cash charge for acceleration of stock-based compensation expense for a particular grant in 2015. These decreases were partially offset by an increase in compensation costs attributable to increased average headcount and merit increases. We had 174 full-time employees as of December 31, 2016 compared to 168 at December 31, 2015. Information Technology. Information technology expenses increased 35% to $7.7 million for 2016 compared with $5.7 million for 2015 due to $1.9 million in costs associated with implementing new information technology platforms, increased research and support expenses, and incremental support costs related to the Woodway acquisition. General and Administrative. General and administrative expenses increased 6% to $9.1 million for 2016 compared with $8.5 million for 2015, primarily due to increased rent and depreciation expenses related to the expansion of our corporate headquarters and amortization of intangibles related to the Woodway acquisition. The increase was partially offset by accelerated depreciation of leasehold improvements in 2015. Provision for Income Taxes. The effective tax rate decreased to 33.4% for 2016 compared to 35.8% for 2015. The decrease is primarily related to a tax charge for uncertain tax positions related to prior years (net of federal benefit) recorded in 2015. For the year ended December 31, 2017, our Economic Earnings decreased by 5% to $38.9 million compared with $41.1 million for the year ended December 31, 2016, primarily due to the decrease in net income related to the $2.5 million legal settlement charge, net of insurance recovery and taxes, and $3.4 million incremental income tax expense related to tax reform. We had cash and investments of $105.6 million and $90.2 million as of December 31, 2017 and December 31, 2016, respectively. Cash and cash equivalents as of December 31, 2017 and 2016 includes approximately $33 million and $20 million, respectively, of undistributed income from Westwood International Advisors. In accordance with the one-time mandatory deemed repatriation required under tax legislation signed into law in December 2017, we have accrued a $1.8 million income tax liability related to this undistributed income. If these funds were needed for our U.S. operations, we would be required to accrue and pay incremental Canadian withholding taxes to repatriate a portion of these funds. Our current intent is to permanently reinvest the funds subject to withholding taxes outside of the U.S., and our current forecasts do not demonstrate a need to repatriate them to fund our U.S. operations. At December 31, 2017 and 2016, working capital aggregated $106.6 million and $86.3 million, respectively. As required by the Finance Code, Westwood Trust is subject to a minimum capital requirement of $4.0 million. At December 31, 2017, Westwood Trust had approximately $16.8 million in excess of its minimum capital requirement. We had no debt at December 31, 2017 or December 31, 2016. Historically we have funded our operations and cash requirements with cash generated from operating activities. We may also use cash from operations to pay dividends to our stockholders. As of December 31, 2017 and 2016, we had no debt. The changes in net cash provided by operating activities generally reflect the changes in earnings plus the effects of non-cash items and changes in working capital. Changes in working capital, especially accounts receivable and accounts payable, generally result from timing differences between collection of fees billed and payment of operating expenses. During 2017, cash flow provided by operating activities, principally our Advisory segment, aggregated $48.0 million compared to cash provided by operations of $47.4 million during 2016 and $55.2 million during 2015. The decrease of $7.8 million from 2015 to 2016 was primarily due to changes in operating assets and liabilities and net income, partially offset by cash transferred from our investment accounts. Cash flow used in investing activities during 2017 and 2016 of $1.2 million and $1.8 million, respectively, was primarily related to purchases of property and equipment. Cash flow used in investing activities during 2015 of $25.1 million was due to the acquisition of Woodway. Cash used in financing activities of $28.6 million during 2017, compared to $34.9 million and $22.1 million during 2016 and 2015, respectively. The decrease primarily related to the 2016 payment of contingent consideration related to the acquisition of our Westwood Trust Houston office and repurchases of common stock under our share repurchase plan during fiscal 2016. Our future liquidity and capital requirements will depend upon numerous factors, including our results of operations, the timing and magnitude of capital expenditures or strategic initiatives, our dividend policy and other business and risk factors described under “Item 1A. Risk Factors” in this Report. We believe that current cash and short-term investment balances and cash generated from operations will be sufficient to meet both the operating and capital requirements of our ordinary business operations through at least the next twelve months. However there can be no assurance that we will not require additional financing within this time frame. The failure to raise needed capital on attractive terms, if at all, could have a material adverse effect on our business, financial condition and results of operations. The following table summarizes our contractual obligations as of December 31, 2017 (in thousands). A VIE is an entity in which (i) the total equity investment at risk is not sufficient to enable the entity to finance its activities without subordinated financial support, (ii) the at-risk equity holders, as a group, lack the characteristics of a controlling financial interest or (iii) the entity is structured with disproportionate voting rights, and substantially all of the activities are conducted on behalf of an investor with disproportionately few voting rights. That is, the at-risk equity holders do not have the obligation to absorb losses, the right to receive residual returns and the right to direct the activities of the entity that most significantly impact the entity’s economic performance. An enterprise must consolidate all VIEs of which it is the primary beneficiary. We determine if a sponsored investment meets the definition of a VIE by considering whether the fund’s equity investment at risk is sufficient to finance its activities without additional subordinated financial support and whether the fund’s at-risk equity holders absorb any losses, have the right to receive residual returns and have the right to direct the activities of the entity most responsible for the entity’s economic performance. The primary beneficiary of a VIE is defined as the party who, considering the involvement of related parties and de facto agents, has (i) the power to direct the activities of the VIE that most significantly affect its economic performance and (ii) the obligation to absorb losses of the entity or the right to receive benefits from the entity that could potentially be significant to the VIE. This evaluation is updated continuously. A VOE is an entity that is outside the scope of the guidance for VIEs. Consolidation of a VOE is required when a reporting entity owns a controlling financial interest in a VOE. Ownership of a majority of the voting interests is the usual condition for a controlling financial interest. Assessing whether or not an entity is a VIE or VOE involves judgment and analysis. Factors included in this assessment include the legal organization of the entity, our contractual involvement with the entity and any related party or de facto agent implications of the Company’s involvement with the entity. Determining if the Company is the primary beneficiary of a VIE also requires significant judgment. There is judgment involved to assess if the Company has the power to direct the activities that most significantly impact the entity’s economic results and to assess if the Company has an obligation to absorb the majority of expected losses or a right to receive the majority of residual returns. We reconsider whether entities are a VIE or VOE whenever contractual arrangements change, the entity receives additional equity or returns equity to its investors or changes in facts and circumstances occur that change the investors’ ability to direct the activities of the entity. Westwood Funds® should be analyzed under the VOE consolidation method. Based on our analysis of our seed investments in these entities for the year ended December 31, 2016, we have not consolidated the LLCs or CTFs under the VIE method or the UCITS Fund or the Westwood Funds® under the VOE method, and therefore the results of these entities are not included in the Company’s consolidated financial results. In allocating the purchase price of a business combination, the Company records all assets acquired and liabilities assumed at fair value, with the excess of the purchase price over the aggregate fair values recorded as goodwill. ASC 820, Fair Value Measurements and Disclosures, defines fair value as the price that would be received to sell an asset or paid to transfer a liability in an orderly transaction between market participants at the measurement date. The purchase price of an acquisition is allocated to the underlying assets acquired and liabilities assumed based upon their estimated fair values as of the date of acquisition. To the extent the purchase price exceeds the fair value of the net identifiable tangible and intangible assets acquired and liabilities assumed such excess is allocated to goodwill. The Company determines the estimated fair values after review and consideration of relevant information, including discounted cash flows, quoted market prices and estimates made by management. The fair value assigned to identifiable intangible assets acquired is based on estimates and assumptions made by management at the time of the acquisition. The Company adjusts the preliminary purchase price allocation, as necessary, during the measurement period of up to one year after the acquisition closing date as it obtains more information as to the facts and circumstances existing as of the acquisition date. Acquisition-related costs are recognized separately from the acquisition purchase price and are expensed as incurred. Goodwill is not amortized but is tested for impairment, at least annually. We assess the recoverability of the carrying amount of goodwill either qualitatively or quantitatively as of July 1 of each fiscal year, or whenever events or changes in circumstances indicate that the carrying amount of the assets may not be fully recoverable. When assessing the recoverability of goodwill, we may first assess qualitative factors. If an initial qualitative assessment indicates that it is more likely than not that the carrying amount exceeds fair value, a quantitative analysis may be required. We may also elect to skip the qualitative assessment and proceed directly to the quantitative analysis. Recoverability of the carrying value of goodwill is measured at the reporting unit level. We have identified two reporting units, which are consistent with our reporting segments. In performing a quantitative analysis, we measure the recoverability of goodwill for our reporting units using a combination of the income approach and market multiple approach. The income approach is based on the long-term projected future cash flows of the reporting units. We discount the estimated cash flows to present value using a weighted average cost of capital that considers factors such as market assumptions, the timing of cash flows and the risks inherent in those cash flows. The key assumptions used in the market multiple valuation require significant management judgment, including the determination of our peer group and the valuation multiples of such peer group. If the calculated fair value of a reporting unit is less than the current carrying amount, impairment of the reporting unit may exist. When the recoverability test indicates potential impairment, we will calculate an implied fair value of goodwill for the reporting unit in a manner similar to how goodwill is calculated in a business combination. If the implied fair value of goodwill exceeds the carrying amount of goodwill assigned to the reporting unit, there is no impairment. If the carrying amount of goodwill assigned to a reporting unit exceeds the implied fair value of the goodwill, an impairment loss is recorded to write down the carrying amount. We completed our annual impairment assessments during 2017, 2016 and 2015 and concluded no impairment losses were required. We operate in several states and countries and are required to allocate our income, expenses and earnings under the various laws and regulations of these tax jurisdictions. Accordingly, our provision for income taxes reflects the statutory tax obligations of the jurisdictions in which we operate. Significant judgment and complex calculations are used when determining our tax liability and in evaluating our tax positions, and we are subject to audits by taxing authorities in each of the jurisdictions in which we operate. We adjust our income tax provision in the period in which we determine that actual outcomes will likely be different from our estimates. Changes in tax laws may result in changes to our tax position and effective tax rates. We include penalties and interest on income-based taxes in the “General and administrative” line on our Consolidated Statements of Comprehensive Income. On December 22, 2017, the Tax Cuts and Jobs Act (the “Tax Reform Act”) was signed into law. Further information on the tax impacts of the Tax Reform Act is included in Note 7 "Income Taxes." We are required to assess whether a valuation allowance should be established against our deferred tax assets based on consideration of all available evidence, using a more-likely-than-not standard. As of December 31, 2017 and 2016, we have not recorded a valuation allowance on any deferred tax assets. In the event that sufficient taxable income does not result in future years, a valuation allowance may be required. We account for uncertain tax positions by recognizing the impact of a tax position in our Consolidated Financial Statements when we believe it is more likely than not that the tax position would not be sustained upon examination by the appropriate tax authority based on the merits of the position. We periodically review our tax positions and adjust the balances as new information becomes available. In making these assessments, we often must analyze complex tax laws of multiple domestic and international jurisdictions. The actual outcome of our tax positions, if significantly different from our estimates, could materially impact the financial statements. At December 31, 2016, we had an uncertain tax liability of $2.5 million. During 2017, we decreased our uncertain tax liability to $160,000. These amounts are included in "Income taxes payable" on our Consolidated Balance Sheets. Our revenues are primarily generated from fees derived as a percentage of our AUM, which is subject to market risks. Additionally, we invest corporate capital in various financial instruments, including United States treasury bills and equity funds, all of which present inherent market risks. We do not currently participate in any hedging activities, nor do we currently utilize any derivative financial instruments. The following information describes the key aspects of certain financial instruments that involve market risks. The value of assets under management is affected by fluctuations in securities markets and changes in interest rates. Since we derive a substantial portion of our revenues from investment advisory and trust fees based on the value of assets under management, our revenues may be adversely affected by a decline in the prices of securities or changing interest rates. A hypothetical 10% decrease in our average assets under management during the year ended December 31, 2017 would have reduced our reported consolidated total revenue by approximately $13 million. Westwood International Advisors operates in Toronto, Canada and accordingly we are exposed to foreign currency fluctuation risk associated with changes in the value of the Canadian dollar relative to the United States dollar. For the year ended December 31, 2017, Westwood International Advisors represented 48% of our consolidated income before income taxes. Changes in the currency exchange rate result in cumulative translation adjustments included in “Accumulated other comprehensive loss” on our Consolidated Balance Sheets and potentially result in transaction gains or losses, which are included in our earnings. The low and high currency exchange rates for a Canadian dollar into a United States dollar for the year ended December 31, 2017 were 0.7273 and 0.8258, respectively. A hypothetical 10% devaluation in the average quoted United States dollar-equivalent of the Canadian dollar exchange rate during the year ended December 31, 2017 would have reduced our reported consolidated income before income taxes by approximately $1.6 million. We performed an evaluation of the effectiveness of the design and operation of our disclosure controls and procedures under the supervision and with the participation of our management, including our Chief Executive Officer and Chief Financial Officer, as of the end of the period covered by this report. Based on that evaluation, our management, including our Chief Executive Officer and Chief Financial Officer, has concluded that our disclosure controls and procedures were effective at the reasonable assurance level as of December 31, 2017 to ensure that information required to be disclosed by us in the reports we file or submit under the Exchange Act was (i) recorded, processed, summarized and reported within the time periods specified in the SEC’s rules and forms and (ii) accumulated and communicated to our management, including our Chief Executive Officer and Chief Financial Officer, to allow timely decisions regarding required disclosure. During the quarterly period ended December 31, 2017, there has been no change in our internal control over financial reporting that has materially affected, or is reasonably likely to materially affect, our internal control over financial reporting. The management of Westwood assessed the effectiveness of Westwood’s internal control over financial reporting as of December 31, 2017. In making this assessment, it used the criteria set forth by the Committee of Sponsoring Organizations of the Treadway Commission (COSO) in the 2013 Internal Control — Integrated Framework. Based on our assessment, we believe that, as of December 31, 2017, Westwood’s internal control over financial reporting is effective based on those criteria. Westwood’s independent registered public accounting firm has issued an audit report on our assessment of Westwood’s internal control over financial reporting. This report appears on page 43. We have audited the internal control over financial reporting of Westwood Holdings Group, Inc. and subsidiaries (the “Company”) as of December 31, 2017, based on criteria established in Internal Control - Integrated Framework (2013) issued by the Committee of Sponsoring Organizations of the Treadway Commission (COSO). In our opinion, the Company maintained, in all material respects, effective internal control over financial reporting as of December 31, 2017, based on criteria established in Internal Control - Integrated Framework (2013) issued by COSO. We have also audited, in accordance with the standards of the Public Company Accounting Oversight Board (United States) (PCAOB), the consolidated financial statements as of and for the year ended December 31, 2017, of the Company and our report dated February 22, 2018, expressed an unqualified opinion on those financial statements. The information required by this item is, or will be, set forth in the definitive proxy statement relating to the 2018 Annual Meeting of Stockholders of Westwood Holdings Group, Inc., which is to be filed with the SEC pursuant to Regulation 14A under the Exchange Act (the “Proxy Statement”). The Proxy Statement relates to a meeting of stockholders involving the election of directors, and the portions therefrom required to be set forth in this Report by this item are incorporated herein by reference pursuant to General Instruction G(3) to Form 10-K. The following table gives information as of December 31, 2017 about shares of our common stock that may be issued upon the exercise of options, warrants and rights under our Fourth Amended and Restated Westwood Holdings Group, Inc. Stock Incentive Plan and the Share Award Plan of Westwood Holdings Group, Inc. for Service Provided in Canada to its Subsidiaries, our only equity compensation plans in effect at that time. The material terms of these plans were approved by our stockholders and are discussed in Note 9 "Employee Benefits" to our Consolidated Financial Statements included in this Report. (1) Includes 454,000 shares available under our Fourth Amended and Restated Westwood Holdings Group, Inc. Stock Incentive Plan and approximately 52,000 shares available under the Share Award Plan of Westwood Holdings Group, Inc. for Service Provided in Canada to its Subsidiaries. We have audited the accompanying consolidated balance sheets of Westwood Holdings Group, Inc. and subsidiaries (the "Company") as of December 31, 2017 and 2016, the related consolidated statements of comprehensive income, stockholders’ equity, and cash flows for each of the three years in the period ended December 31, 2017, and the related notes (collectively referred to as the “financial statements”). In our opinion, the financial statements present fairly, in all material respects, the financial position of the Company as of December 31, 2017 and 2016, and the results of its operations and its cash flows for each of the three years in the period ended December 31, 2017, in conformity with accounting principles generally accepted in the United States of America. We have also audited, in accordance with the standards of the Public Company Accounting Oversight Board (United States) (PCAOB), the Company's internal control over financial reporting as of December 31, 2017, based on the criteria established in Internal Control - Integrated Framework (2013) issued by the Committee of Sponsoring Organizations of the Treadway Commission and our report dated February 22, 2018, expressed an unqualified opinion on the Company's internal control over financial reporting.